Can Soy Products Contribute to Menopausal Hair Loss? Question: I am a woman in menopause, and my friends all rave about soy. They stuff me with soy-based shakes and soy milk whenever I visit their houses, and email recipes to me for baked tofu, miso soup and soy burgers. I wonder if soy products could contribute to hair loss or cause other problems while my hormones are fluctuating during menopause. What do you think? Dr. Shapiro, Hair Transplant Doctor Answers: I am not surprised that you are confused about soy. The information about soy products and hair loss is sometimes contradictory. In menopausal women, an underactive thyroid (hypothyroidism) is fairly common and can cause wide-spread metabolic problems. The thyroid needs iodine to function properly. Some studies have indicated that soy might interfere with iodine uptake, suppressing thyroid function. Instead of soy-based shakes, try Dr. Shapiro’s Help Hair Shake. This product is whey-based rather than soy-based because we are concerned with the risk of thyroid issues. The product has added iodine for essential thyroid function. If hair loss occurs from hypothyroidism, it will not grow back. So if you are worried, consult your doctor and ask for lab tests. 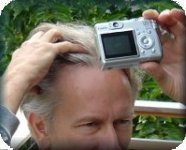 This entry was posted in General, Hair Loss in Women on July 8, 2010 by Larry Shapiro.